This past Sunday was my drama team’s Christmas party. Since I’m a rather indecisive individual, I made two cakes. 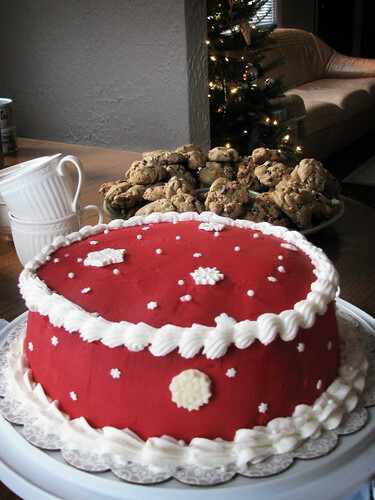 The Red cake is red velvet & white cake in stripes on the inside. Covered in red buttercream, with snowflake sprinkles and chocolate sprinkles. 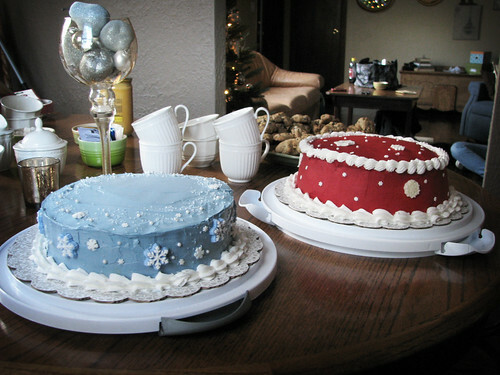 The Blue cake has a layer of strawberry (purple – I was originally going to add purple onto the design), and a cream cheese flavored layer. Buttercream icing and snow sprinkles. Yummy chocolate cookies are by the lovely Ashley, whose home we invaded. She’s kinda fabulous. So my goal is to take some artistic shots next time I bake something pretty. I’m pretty awful at remembering to take pictures of things I make. How sad is that? Them cakes look mad good YUMMMO!